I actually bought this jerky from a website called "The Cajun Turkey Company", thinking I was getting Cajun's brand. But when I recieved it in the mail, I found Prasek's jerky; they never explained they were a reseller of Prasek's. But that's ok, I had Prasek's on my list of brands to buy, and I've heard good things about this jerky. Cured with water, salt, brown sugar, sodium acetate, sodium erythorbate, flavorings, sodium nitrite, monosodium glutamate, natural smoke flavor, dried jalapeno peppers. The first thing I taste from the surface of these pieces is a smoky flavor, and a lightly salty flavor. I can feel a little bit of heat in the back of my mouth, and the jalapeno flavor slowly comes on. Overall, a light surface flavor intensity. The chewing flavors start with stronger saltiness, followed by more smoky flavor, then some natural meat flavors. Meanwhile the heat and flavor of the jalapeno increases. For being a Jalapeno flavored beef jerky, it definitely does live up to that claim. I get a decent amount of jalapeno pepper flavor, much like the flavor of raw jalapenos. And I do get a fair amount of jalapeno heat. I'd rate it on my hot scale as a medium. It doesn't seem to build up any higher over several pieces. But I wouldn't say the jalapeno dominates the flavor of this jerky. Instead I'd give that honor to the smokiness and the natural meat flavors. Actually, the smokiness is more dominant the meat flavors. The meat flavors have a moderate amount of saltiness in it, and ends up with a flavor comparable to smoked sausage. The saltiness, again, seems to be at a moderate intensity overall. But aside from the smokiness, meat flavors, salt, and jalapeno, that's all I'm tasting here. Overall, it's a simple tasting jerky, largely a smoky beef jerky, with some salty meat flavor, and a noticeable jalapeno spiciness. These are slices of whole meat, sliced into strips about 1/4 thick and wide, and about 4-7 inches in length. This is a semi-moist jerky inside, with the outside feeling very moist. The strips are all cut with lengthwise with the grain, making them very flexible. Biting a chunk off from a strip seems easy to do, and chewing is a little chewy, but still within the easy range. The chewing texture starts out feeling stiff and rubbery, with some rubbery chewing resistance initially. Some light biting and sucking, and it breaks down without much effort. Once chewed down to a soft mass, it has a very meaty, steak-like chewing texture, comparable to a well-done cooked steak. The strips all look very lean, I didn't find any visible chunks of fat, and found no tendon, gristle, or stringy sinews. Handling this jerky tends to leave some moisture on my fingertips, which when dries up makes them feel slightly sticky. Note: I actually bought this from The Cajun Turkey Company's website, and paid a per ounce price of $3.98!! For general jerky snacking purposes, at the $1.98 per ounce price, this seems to present a good value. 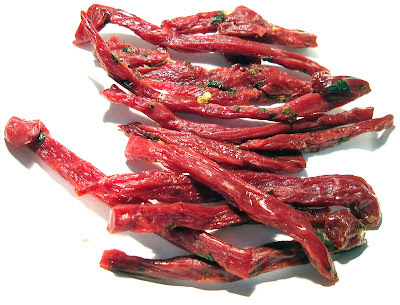 I'm getting a good deal of snackability for its good overall flavor, good meat consistency and good chewing texture. The $1.98 per ounce price is little bit more than what you'd pay at the grocery store for the mass-market brands, but I think this offers better flavor and quality. 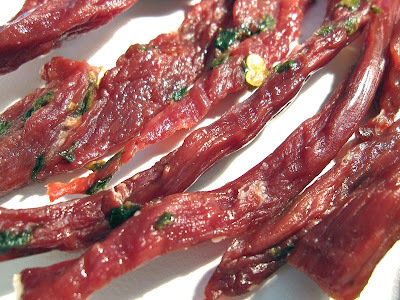 As a jalapeno flavored beef jerky, at the same $1.98 per ounce price, it's also a good value. I do get a noticeable jalapeno flavor, comparable to raw jalapenos, and some moderate jalapeno heat, all with a good meat consistency and chewing texture. 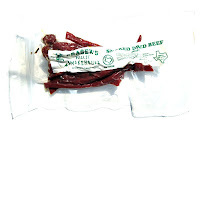 This Jalapeno beef jerky from Prasek's Hillje Smokehouse is largely marked by a smoky flavor, and a natural meat flavor, with a fair amount of saltiness. The jalapeno flavor is well noticed, but not dominant, and there's a moderate amount of jalapeno heat as well. But while it's a good tasting jerky, I didn't find it to stand out all that much from other good-rated beef jerky brands, or even jalapeno flavored jerky brands. I didn't find anything in this that made me open my eyes and think "wow!". There's actually a simpleness to this that over several bites makes me want an extra ingredient. But this does offer a pleasant, semi-moist, easy-eating, extra lean meat consistency. And it has a very meaty, steak-like chewing texture. I think a good beer to have with this is a light tasting cream ale.